Schneiderman is a world class mathematician by day and jazz pianist by night, this unique dual career shows its dual edge in his music. Starting from scratch by teaching himself the basics of serious math from texts picked up from street vendors, Rob worked through the undergraduate mathematics canon at the City University Of New York (he thanks the mathematics department at CCNY for their support and tolerance of his frequent breaks for gigs on the road), subsequently gaining acceptance into the UC-Berkeley Mathematics PhD program. Necessitating a move to Berkeley from NYC, Rob conducted his doctoral study while enjoying being part of the vibrant Bay Area jazz community. After his doctorate, Schneiderman began an enduring association with the Max Planck Institute for Mathematics in Bonn, Germany, and after postdoctoral stints at NYU’s Courant Institute and UPenn, he returned to NYC for good in 2006 to assume a position as a mathematics professor at Lehman College CUNY in the Bronx. 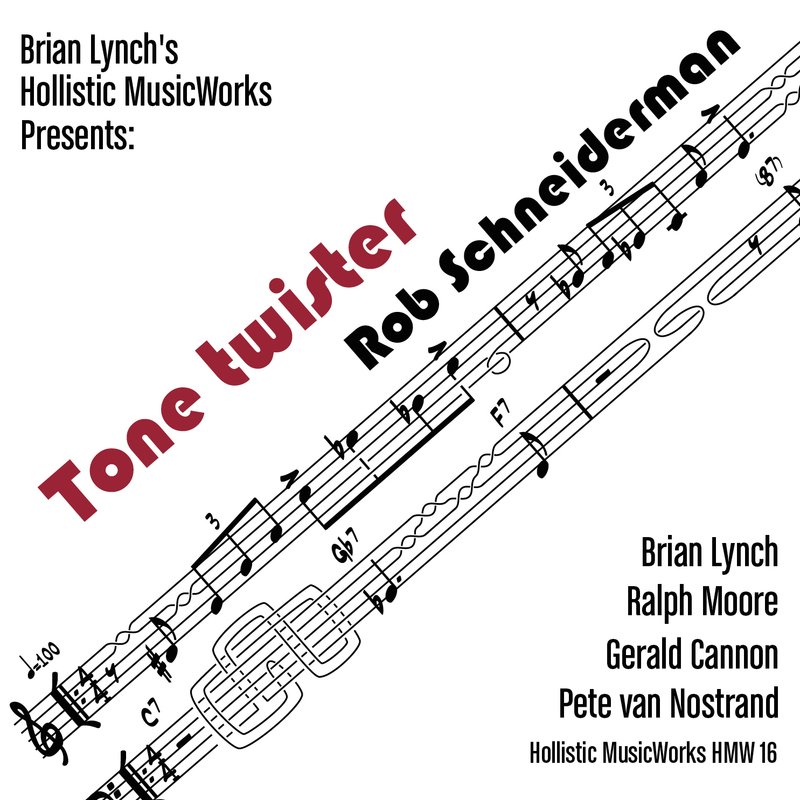 Tone Twister begins with a Latin selection that has an eloquent bop ornamented melody called “Footloose Freestyle.” Schneiderman’s compositional style is straight to the point and unfolds like a beautiful formula. Each section leads to the next fluidly and the solos all have backgrounds that are interesting and relate to the original theme. The rhythm section brings out the best in both Moore and Lynch’s solos, helping to build them to full promise. Schneiderman’s solo unfolds organically with catchy chordal work and interesting melodic colors. Schmeiderman takes his compositional solo with an excellent “shout chorus” that has outstanding two horn writing. A laid-back strolling groove feel is how the quintet frames the lyrical classic “Unforgettable.” The arrangement has well-crafted harmonic twists and excellent orchestration. Schneiderman takes a fine solo on this one, his single line work is crafty and very easy to follow. Both horn players deliver the goods; melodic and energetic solos are supported by a radiating pulse from the rhythm section. The stomp is on throughout the dance-inspired 4-on-the-floor “Slapdance-Tapstick,” which climaxes into improvised counterpoint and then a percussion out-chorus. Starting out with a very “Monkish” piano solo from Schneiderman, the melody also follows in the same vein. The swing is so in focus from the core unit of Van Nostrand and Cannon, it illuminates an overall good feeling. A theme throughout the recording itself. It seems that music and math do marry well, and on Tone Twister we get to see the hypothesis become theory.